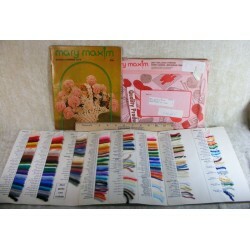 Pre-printed and stamped embroidery kits already put together for you! Cross stitch, needlepoint, crewel and all different kinds of hand embroidery.These kits are made by different manufacturers like Bucilla, Dimensions, Sunset and various designers. All different kinds and themes - Christmas, baby, pillow, holiday, pictures you can frame.Vintage and discontinued kits for all skill levels from beginning to intermediate and expert. Since they are vintage, there is usually only the one in stock to buy. Embroidery Kits There are 16 products. 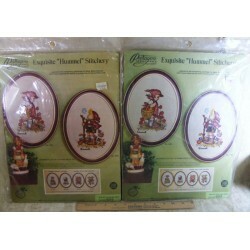 Cute crewel embroidery kit of Hummel's peasant boy figurine! Vintage, 1970s Paragon Needlecraft kit which is discontinued. Picture shows a little boy standing in a field of flowers. This embroidery kit is 1 of 2 in a series called Hummel Peasant Children. You can stitch something perfect for a Hummel collector or to decorate your home with with this kit. 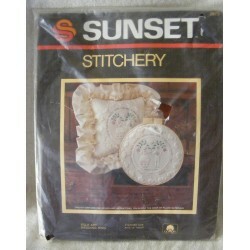 Discontinued embroidery kit from Sunset. It is their Folk Art Wedding Ring pattern. Candlewick embroidery with hearts. Make it as a pillow or a picture for the wall. Terrific for a wedding or anniversary. Vintage, from the 1980's. You can create a cute gift for the bride or groom or remembrance from a past wedding. 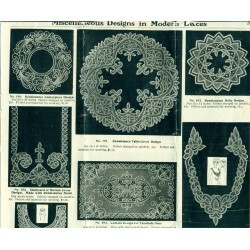 Lace kits from the Edwardian era are on these catalog pages. 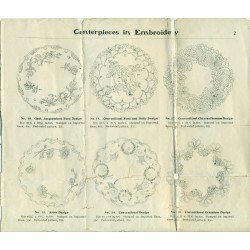 Great examples of different laces the ladies were making in the early 1900s. Women's clothing like collars, corset cover, fan, waist fronts and sets. Also household laces like table cloths, curtains for doors, doilies and pillows. All pretty, dainty and lovely lace kits! 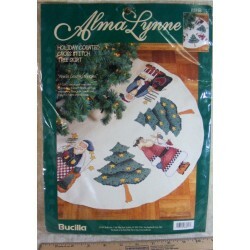 Bucilla needlepoint Kit No. 4674 Bunny pattern. Blossom's Friend Buddy. Homespun bunny rabbit wearing an apron and hat. Carrying a basket of flowers. 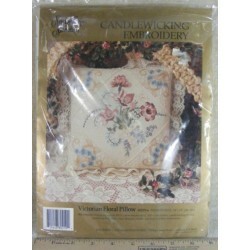 Embroidery stitch a nice home decorator item with this kit. Makes a nice picture or shaped pillow. Instructions included. Discontinued from 1993. 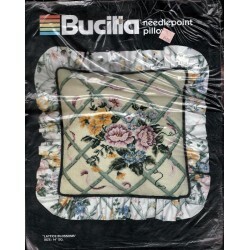 This is a nice, vintage needlepoint kit from Bucilla! 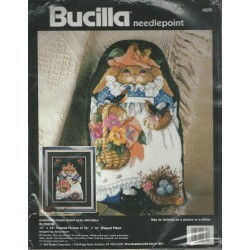 Bucilla needlepoint Kit No. 4619. Pillow with ruffle all around it. Would look great framed and hanging on your wall too! Pretty lattice and floral pattern. Light and dark pink, almost red, blue and green colors help accent your home color scheme. Discontinued. 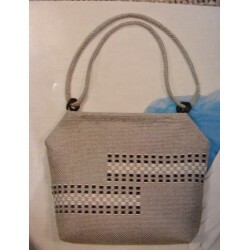 This is a nice needlepoint kit from Bucilla! 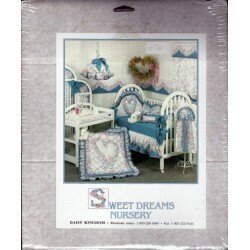 Dimensions crewel embroidery kit. From the 1980's. Americana Floral Pillow designed by Nancy Moyer. Pretty, country style pattern with a basket and floral arrangement in the center. Complete and unopened. Nice as a pillow. Pretty as a framed picture too. 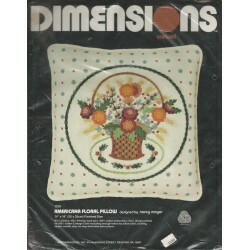 This is a nice, vintage embroidery kit from Dimensions and the 1980's! Columbia Minerva cross stitch kit from the 1970's. No. 6716, Colonial Rose. Embroider a pretty, elegant pillow for your home. Framed, it would make a nice picture. 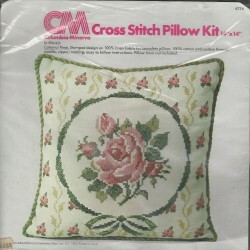 Large cross stitched rose in the center surrounded by a green ribbon and small rosebuds. Discontinued, vintage and from the 1970's. 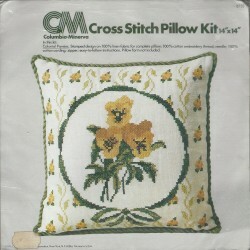 This is a pretty pillow kit from Columbia Minerva! Cross stitch pillow kit from the 1970's. No. 6735, Columbia Minerva. Complete and unopened. Large pansy motif in the center surrounded by ribbon and small pansies. Perfect as a pillow. Or, a nice picture when framed. Embroidered in cross stitch. You can create a nice item for your home with this kit from Columbia Minerva and the 1970's!